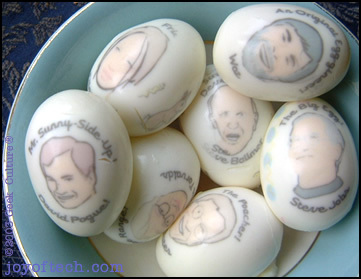 Just in time for Easter, we've prepared a treat of high tech Easter eggs featuring the faces of many of your favorite geeky personalities! 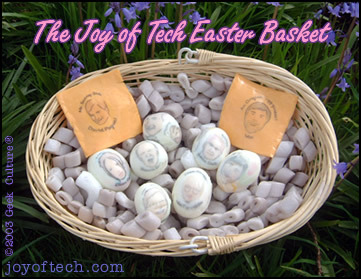 Based on our "Eggheads" Joy of Tech comic, we've created a special egg transfer graphic to help you make the most of this egg-ceptional holiday. Just follow these somewhat simple directions, and you too can be enjoying your own eggheads. Believe it or not, there is an art to boiling eggs. Egg boiling is of course effected by many factors, age of the eggs, temperature, air pressure, altitude, attention span of the boiler... etc. You can use these directions as a guide, but in the end, you alone must learn and hone your craft. Use The Force if necessary. Start off by making sure the eggs are room temperature. Cold eggs may crack when placed in hot water. If your eggs are cold but you can't wait to start, place the eggs in a bowl of tepid water until they reach room temperature. Once the 11 minutes is up, Drain the pot and rinse with cold water. Crack the egg shells all over while constantly running cold water over the eggs. You may want to just try one egg first, to make sure the eggs are fully hardboiled. If not, put the eggs back on simmer for some more cooking. Once the shells are cracked all over, you can peel them. Hopefully the shells will slip off easily. Best of luck and be oh-so-gentle... those eggs need to have a perfect surface! 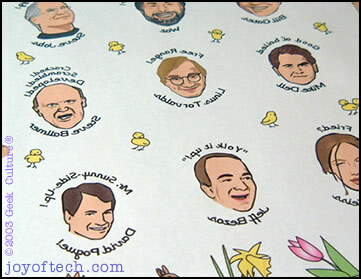 Download the special Reversed Eggheads graphic, save it to your computer, then print up a fresh page. I just used regular paper and my Epson inkjet, set for high quality printing. The special Reversed Eggheads graphic, ready for egghead making! Graphics are flipped so they end up as a positive on the egg. Now comes the exciting part! 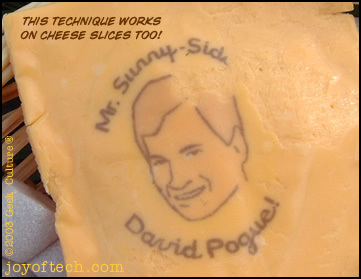 Carefully roll an egg over an image, trying not to repeat roll, and making sure you roll over all of the text too. Behold!! With any luck, you should have a rather freaky looking Egghead in your hands! 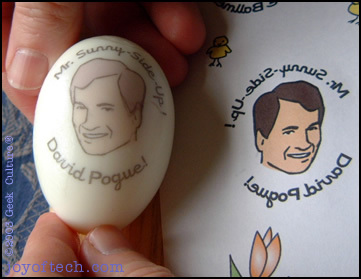 A David Pogue egghead is freshly "hatched!" Linus! Looking a little pale, but still,... Tux would be proud! 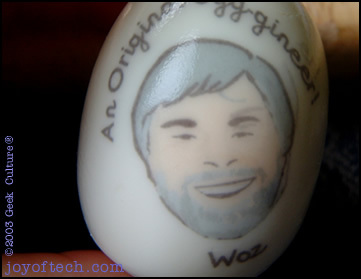 An egghead collection would not be complete without the Woz! A bowl of fresh eggheads! Hours of fun! You will be amazed at the kinds of things heads will transfer themselves to! 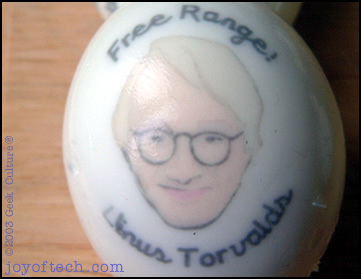 Disclaimer: You will undoubtedly be tempted at some point to eat your eggheads, but please, do not eat the eggheads unless you are using edible vegetable dyes in your inkjet. (Trust me, you are not.) 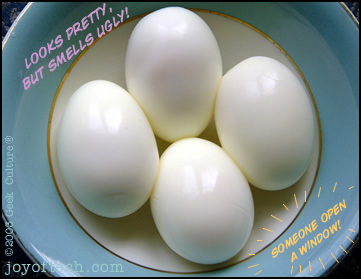 Eggheads may begin to smell if left in your geekosphere for very long periods of time. Do not introduce eggheads into postal systems, or leave them unattended. If eggheads develop into chickens, increase boiling times. Email a friend some Joy! Help keep the joy in Joy of Tech...tip the cartoonists!